By Jeff Treppel. Not the Tarot with the shouty guy from Nightwish, these Tasmanian devils possess a decidedly anachronistic point of view. This stuff sounds like 70s pulp fantasy book covers look – and not the badass ones done by Michael Whelan. They reside in the Shire, not Mordor. Not the Tarot with the shouty guy from Nightwish, these Tasmanian devils possess a decidedly anachronistic point of view. This stuff sounds like 70s pulp fantasy book covers look – and not the badass ones done by Michael Whelan. They reside in the Shire, not Mordor. It’s hard to examine Reflections without touching upon what came before. It’s pretty easy to tell what their record collection looks (and smells) like. Their strength lies in how cannily they mix the ingredients in their cauldron. There are recognizable pieces here and there, sure: a Buck Dharma guitar flourish in “Strange Dimensions,” atmospheric Rainbow organ underpinning “Heed the Call,” the Led Zeppelin III homage of the title track. Uriah Heep, Pagan Altar, and Gentle Giant poke their heads in frequently. It always feels like you’re right on the cusp of being able to place who they sound like, but you can never quite nail them down. Fortunately, that dance fascinates, not distracts. There’s a pastoral quality to these songs that really shines through, the production making it seem as if they were captured in a fairy glade. 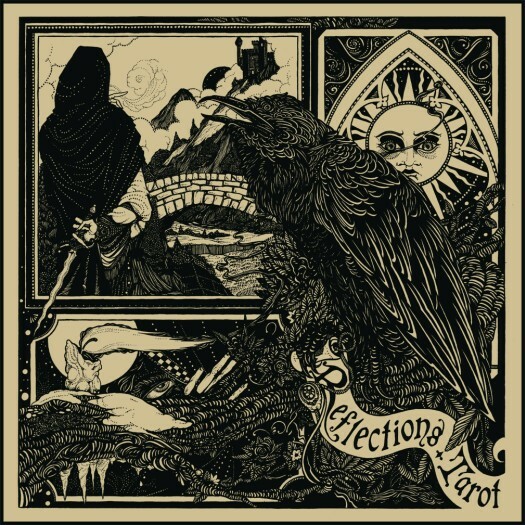 Considering the potential Tarot had on their preceding EP’s – a potential that was often hampered by subpar production – they more than fulfill their promise here. The main point of contention for some people may be The Hermit’s singing, which always sounds just on the verge of going flat. Sometimes it works, sometimes it doesn’t (he’s at his best when he’s at his gentlest, like on the beginning of “Living for Today”). It’s not enough to poison the rest. Don’t call Reflections a throwback; call it a peek through the mists to a better time that never existed. It's warm and mellow metal. Perfect for when you need a break from the extreme stuff. Enjoying this quite a bit! One of my favorites from last year. So ...nice.